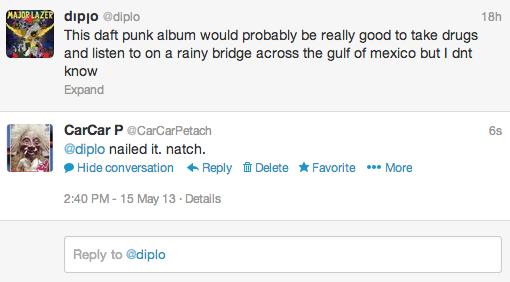 daft punks new album is streaming on itunes + of course music producer n blackberry spokesman diplo reviewed it on his twitter. this = my review of diplos review. lets go thru his v critically shrewd tweets 1 by 1.
according 2 goggle maps there r 0 bridges that span the gulf of mexicon, but if there were, n it was atmospherically raining, it would potentially maybe b rly profound 2 drive across the Mexican Gulf Bridge on mollies 2 multiples of these tracks on the album. that i do no. nowadays kids just want 2 drop the base/angel mollies but back when i n diplo were rambunctious teens driving around in our dads mercedeses listening to kid a stoned with matt schick music was real. obvi. n obvi its natural 2 worry if nowadays kids arent primed 2 appreciate stellar jammage like we were. but also n obvi ppl have been worrying abt that 4vr so whtvr. its pretty impossibly tough 2 guess some1s SAt scores from their guest tracks on daft punks albums. that said i would place pandy bears at somewhere in the 1350-1450 range, not too smart that youre a jerk with a billion friends but 0 friends like zuckerberg but smart enough to know when youve arrived in chill-prog paradise. as person who has no idea who todd edwards =s n has never been alone or in a waffle house or heard a broken jukebox play music much < ronald mcdonalds songs im going 2 go ahead n agree with diplos completely. is art supposed 2 emerge x-tempo-raneous-lee from the artists consciousness or w intense thought n consideration? is what i think diplo is asking here. whatever u think abt georgie mordors soliloquy before this song this song =s the abs best like Godspeed produced by herbie hancock that ive been dreamin abt since freshman year of nyu. 1 of my favorite songs is ‘u got the touch’ featuring john c reilly of the dewey cox story fame and alot of ppl 4get that mark wahlberg was a v great musician b4 he was a v great thespian. but u just have 2 give it 2 julian whitehouses on this track he is so vuln n t-pained its like the strokes never started suckin n making nes-pop for the critics who moved 2 south brooklyn n hate them now. 4 stars. 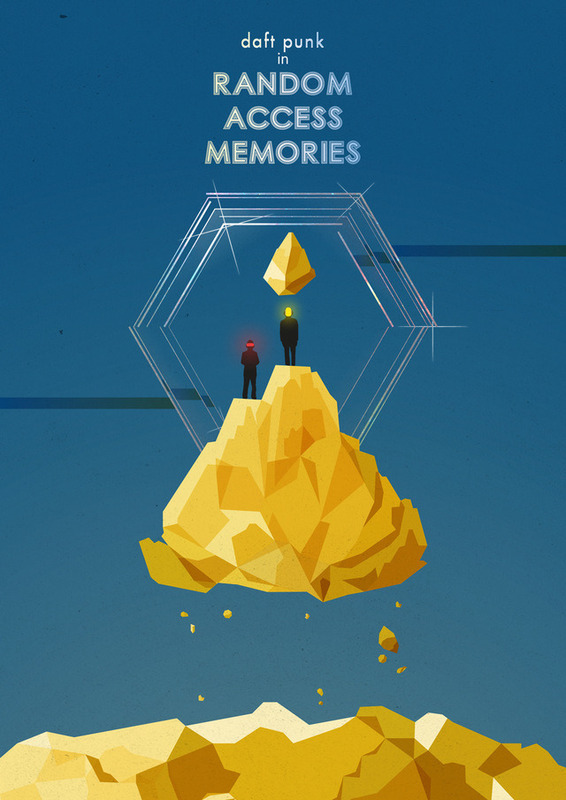 ive been 2 La not louisiana a few times n i guess there r a lot of reasons 2 hate it like traffic on carmageddon n the toxic mothership cloud of pollutants that sits atop the city ~ a toupee knit of the hairs of mutant animals but im not sure what abt random access memories wld make u hate it. on the bright side i love palling around w our neighboritos from south of the border n tagging cars a la jet set radio. again i have 2 disagree with dopli on this 1 n say the song w paul williams needs > backchain n 1/5 < ragtime barbershop quintet. with these ratios in place in the mix the song cld have really popped off.